Aqueous (watery) tear deficiency is caused by either poor production of watery tears or excessive evaporation of the watery tear layer. Poor production of tears by the tear glands may be a result of age, hormonal changes, or various autoimmune diseases, such as primary Sjogren syndrome, rheumatoid arthritis, or lupus. Evaporative loss of the watery tear layer is usually a result of an insufficient overlying lipid layer. Some medications, such as antihistamines, antidepressants, beta-blockers, and oralcontraceptives, may decrease tear production. If blinking is decreased or if the eyelids cannot be closed, the eyes may dry out because of tear evaporation. When you read, watch TV, or perform a task that requires close attention with your eyes, you do not blink as often. This decreased blinking allows excessive evaporation of the tears. 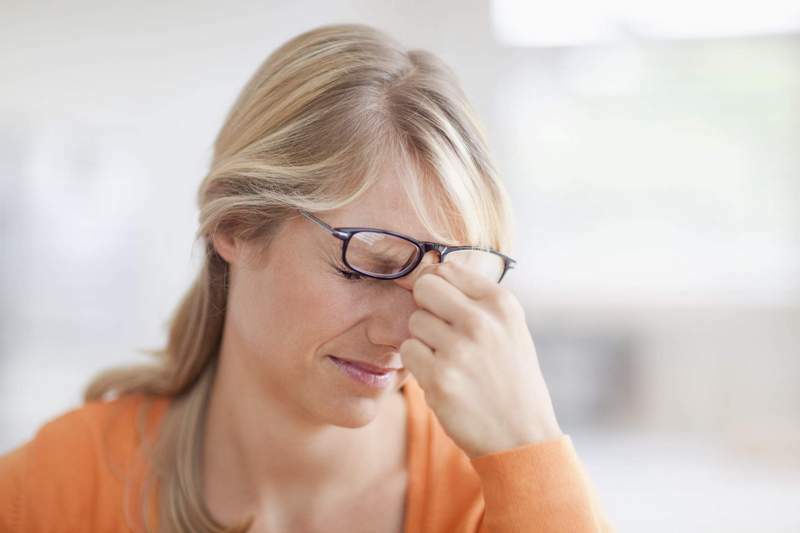 Certain conditions, such as stroke or Bell palsy, make it difficult to close your eyes on your own. As a result, your eyes may become dry from tear evaporation. Abnormal production of mucin by the conjunctiva may occur. burns to the eye or because of different autoimmune diseases, such as Stevens-Johnson syndrome and cicatricial pemphigoid. This abnormal production leads to poor spreading of the tears over the surface of the eye. The surface of the eye can dry out and even become damaged, even though more than enough watery tears may be present. Insufficient lipid layers are the result of meibomian gland dysfunction, as with rosacea or following oral isotretinoin medication. Meibomian glands are the oil glands in the eyelids that produce the lipid layer. If the oil glands become blocked or if the oil is too thick, there may not be enough oil to cover the watery tear layer to prevent its evaporation. Also, if an infection is present along the eyelids or the eyelashes, called blepharitis, the bacteria may breakdown the oil so there may not be enough oil. Discomfort in the eyes ranging from a light pain to a grainy, scratchy feeling in the eyes are possible. The eyes may also become itchy, red, or tears may start to flood the eyes. People with dry eyes will generally experience strain when using the eyes on focusing tasks like watching the TV, knitting, and other activities. The symptoms described above may not necessarily mean that you have dry eye. However, if you experience one or more of these symptoms, contact your eye doctor for a complete exam. Testing for dry eyes can be performed through Schirmer’s test, is performed by placing a small piece of filter paper inside the lower part of the eyelids. The eyes are closed for a few minutes and taken out to measure the amount of tear production. The Schirmer’s test can determine if there is difficulty in tear production or if the tears are not efficient in maintaining eye health. Replacing natural tears with artificial tears is the basis of treatment. Artificial tears are available and are used as eye drops to lubricate the eyes and replace the missing moisture. Some patients with mild dryness may benefit from blinking more frequently, especially when reading, driving, or watching television. Conserving the naturally produced tears is another approach to keeping the eyes moist. After bathing the eye’s surface, tears enter a small opening in each lid, the punctum, and drain through a small canal, the canaliculus, into the lacrimal sac and down the naso-lacrimal duct into the nose. These channels may be closed temporarily, or permanently, by your ophthalmologist. The closure creates a reservoir of tears which allows the eyes to stay moist for longer periods of time. Drink plenty of water to keep the body moisturized. Both furnaces in the winter and air conditioning in the summer decrease the humidity in the air. Minimize there use. Avoid having excessive air movement by decreasing the speed of ceiling fans and/or oscillating fans. Hot compresses and eyelid scrubs/massage with baby shampoo help by providing a thicker, more stable lipid layer. This is especially helpful if you have meibomian gland dysfunction or blepharitis. The heat warms up the oil in the oil glands, making it flow more easily; the massaging action helps get the oil out of the glands. The cleansing action decreases the number of bacteria that break down the oil. If you notice your eyes are dry mainly while you are reading or watching TV, taking frequent breaks to allow your eyes to rest and become moist and comfortable again is helpful. Make sure medication is not causing dry eyes. Eat healthy food containing eye nutrients especially with vitamin A, C, and E and if need be take supplements containing flax seed and Omega-3 fatty acids. Get plenty of sleep to keep eyes healthy. Dry eye is caused by an increased rate of evaporation of the tear film or a decreased rate of production of the tear film. Over time, dry eye can lead to vision problems, causing sufferers to need stronger lens prescriptions every two years. In addition, dry eye can contribute to eye redness and tearing as well as wrinkles.